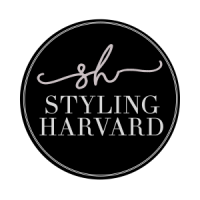 Ovaries before brovaries, uteruses before duderuses, and so on! If you saw my last post, I had the dining room decked out for this intimate little gathering. What you didn’t see was the surprises I had for the girls. 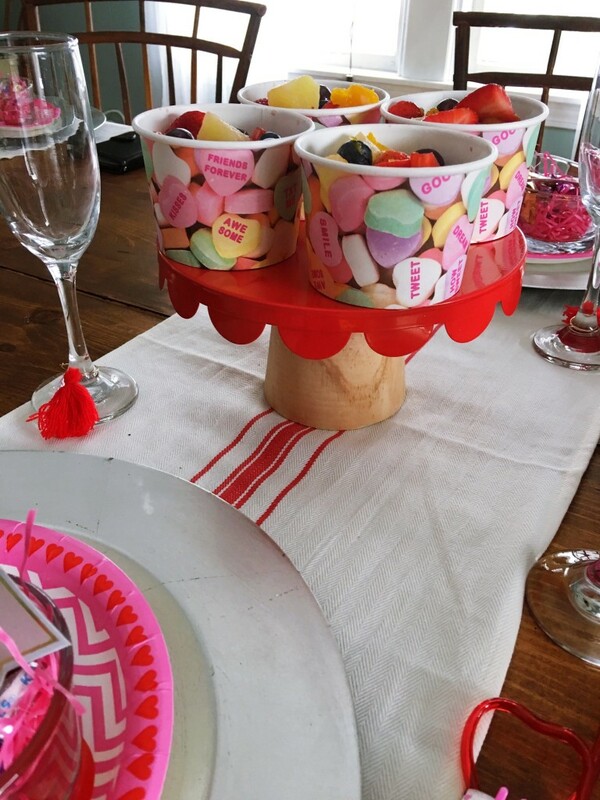 Read on for some easy and inexpensive DIYs and party details. 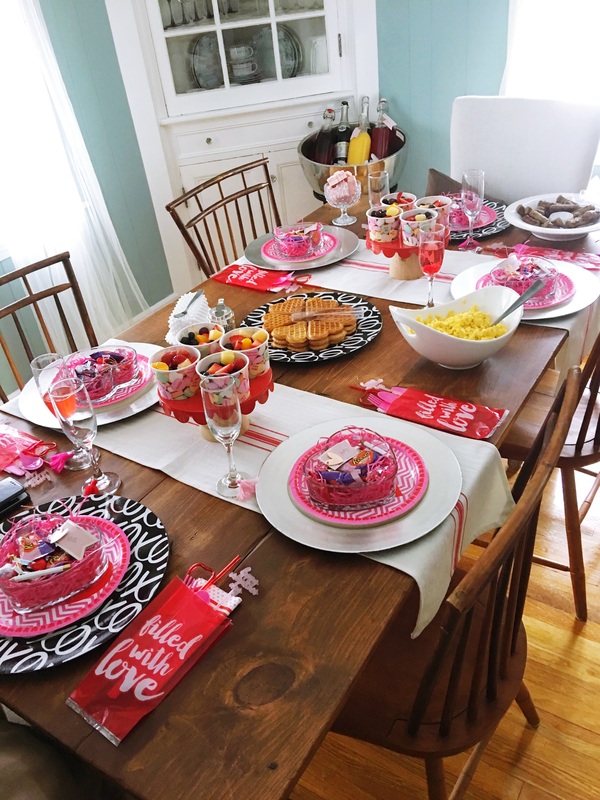 Every Galentine’s Day needs waffles. 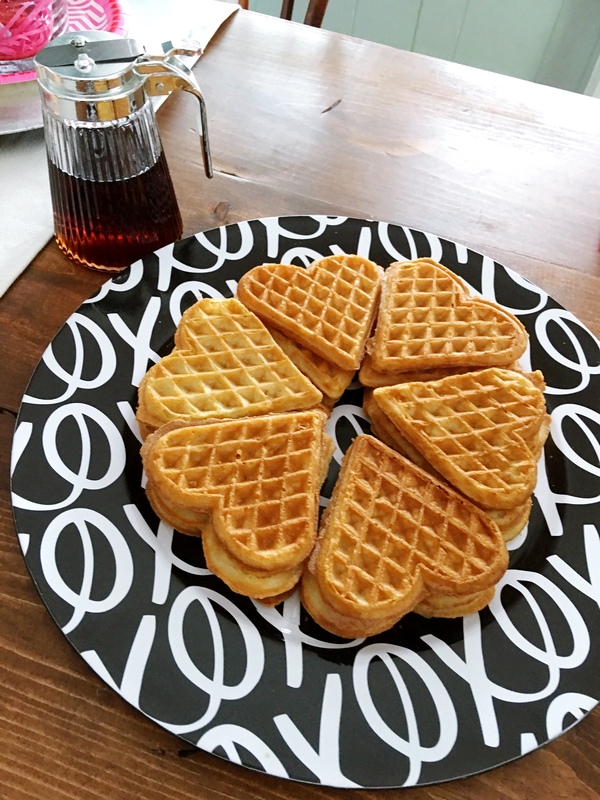 What better waffles to serve than these heart shaped mini ones from Ikea?! 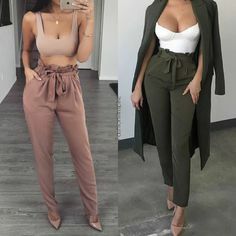 Allllllll the heart eyes! No brunch is complete without mimosas and I sure do love me some champagne for breakfast (or anytime of day!). I bought a variety of juices and poured them into glass bottles. I filled my oversized champagne bucket with ice, added the juices and champagne and the girls helped themselves. 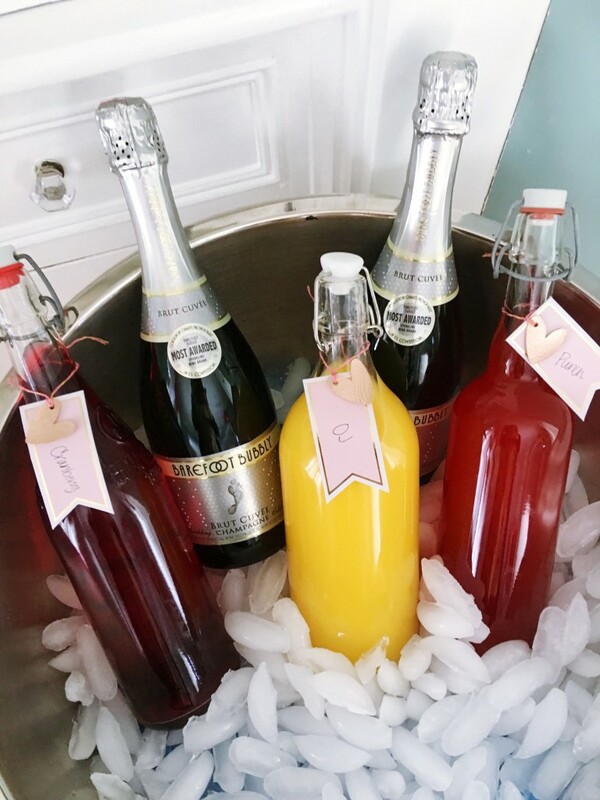 Super easy mimosa bar! 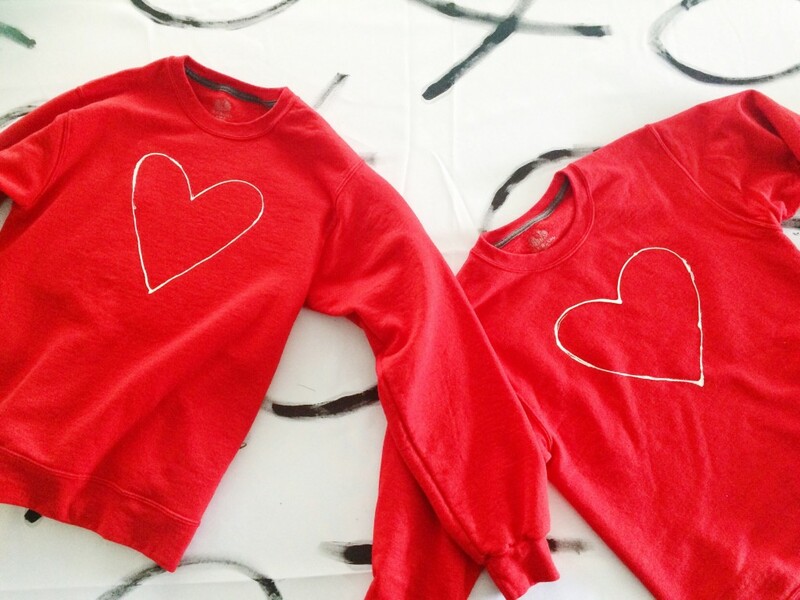 Last year, we made DIY V-day sweatshirts. This year was a slightly bigger crowd and I wanted to keep the gift budget down. 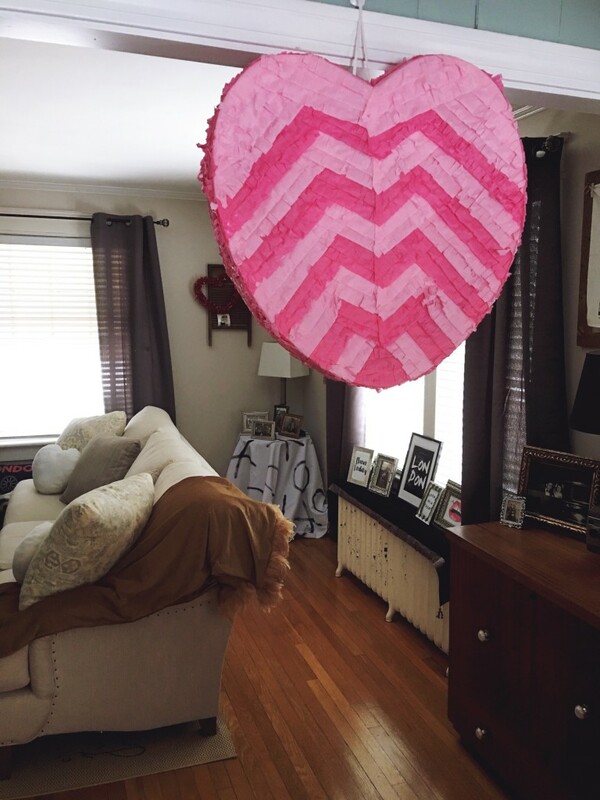 My sister donated her heart shaped shaped piñata and I filled it with some last year V-day clearance items from Target and nips. Plus, it’s always fun to bash something! 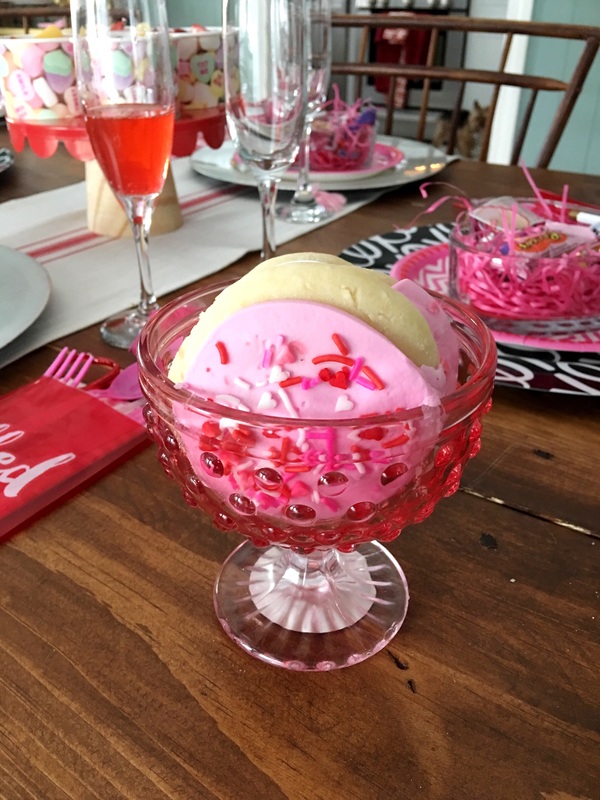 I also bought heart shaped glass bowls from Dollar Tree for each guest. 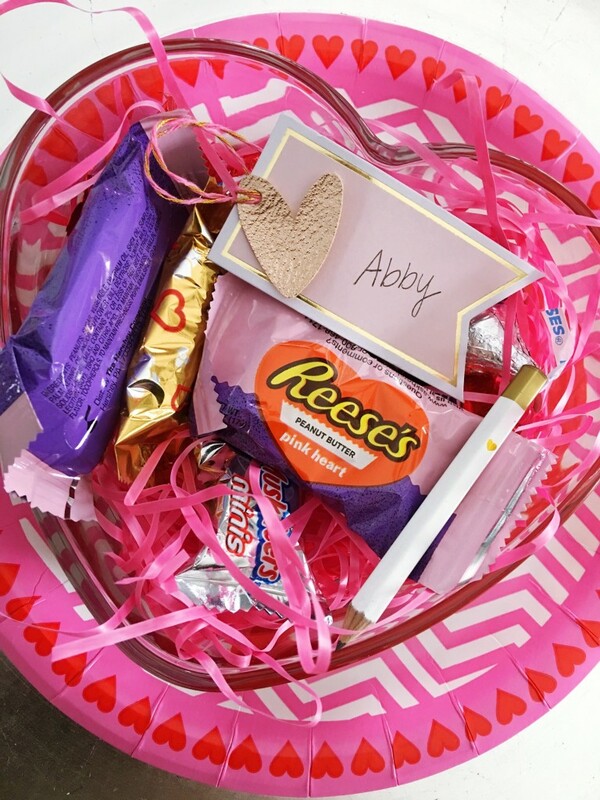 I filled them with some pink basket grass and added candy to them. I tied gift tags with each girl’s name on it and they took them home as favors. 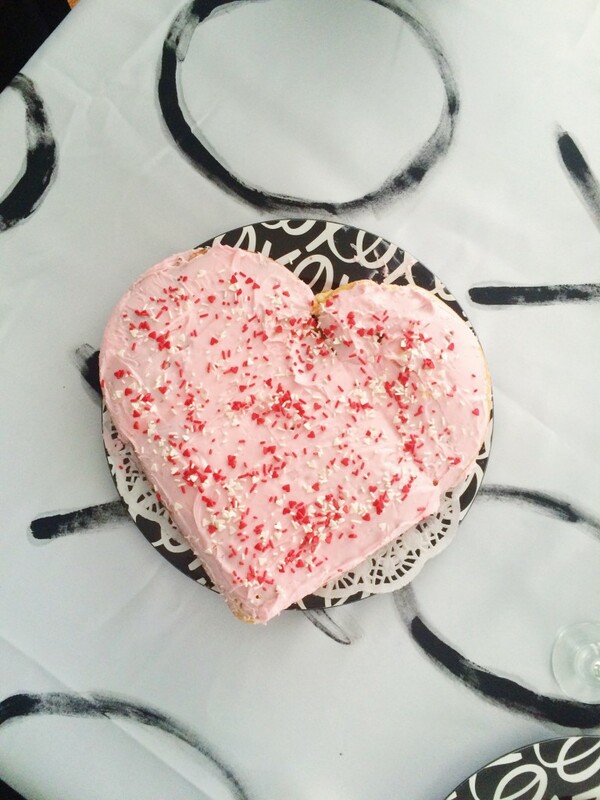 I made a heart shaped cake last year. While it was a piece of cake to make (pun intended), I wanted something less time consuming so I bought some Valentine’s Day bakery items. 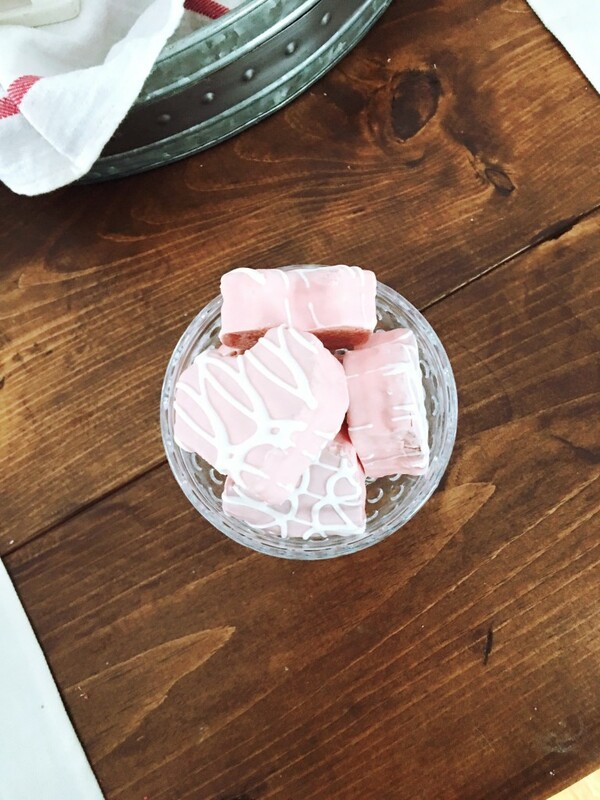 I styled the table with silver and black and white XO chargers with lots of pops of red and pink. Since I wanted to be able to sit and enjoy my guests, I made sure clean up would be simple. Paper plates and plastic cutlery did the trick. Everything got tossed afterwards and the only thing to wash was the champagne glasses and serving dishes. My sister came dressed for the festivities! 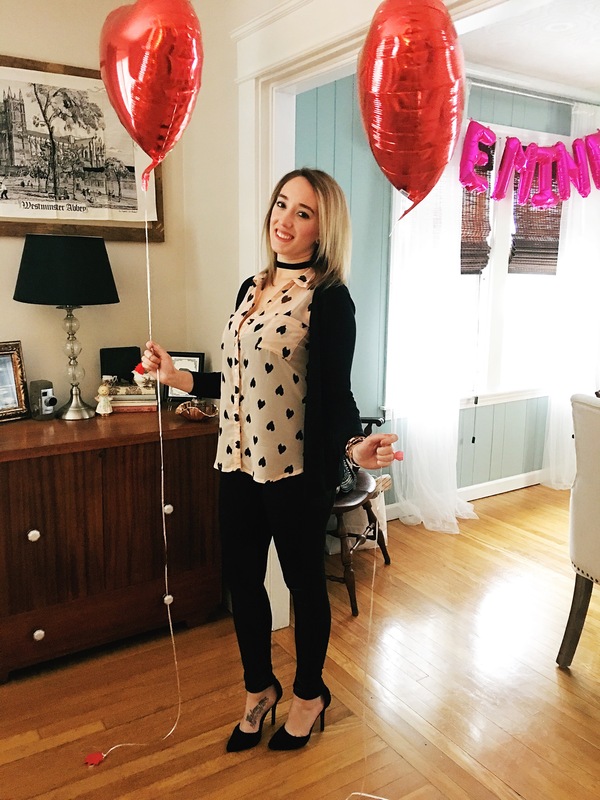 If you follow me on Instagram, you may have seen the the commotion these balloons caused at 4 am! 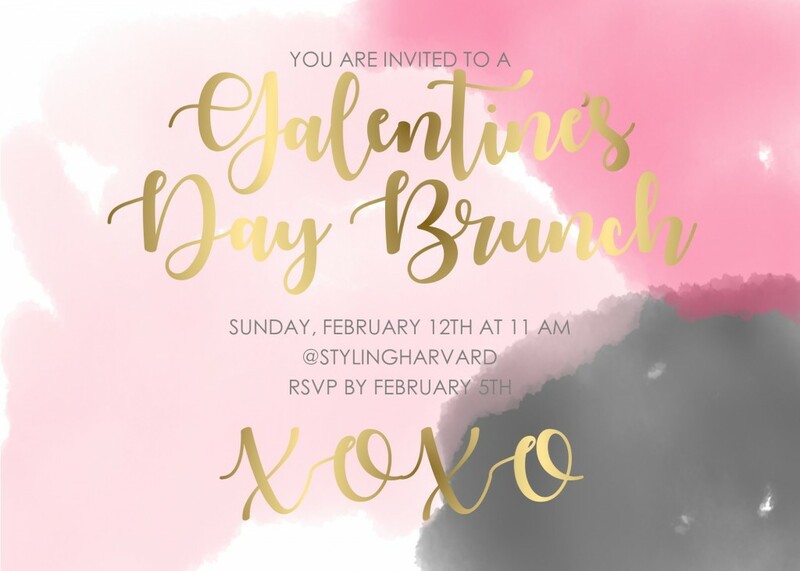 Galentine’s Day combines two of my favorite things: brunch and my girls. Oh, and mimosas! If you celebrated with your gal pals, I hope you had as much fun as we did! Happy Valentine’s Day!! 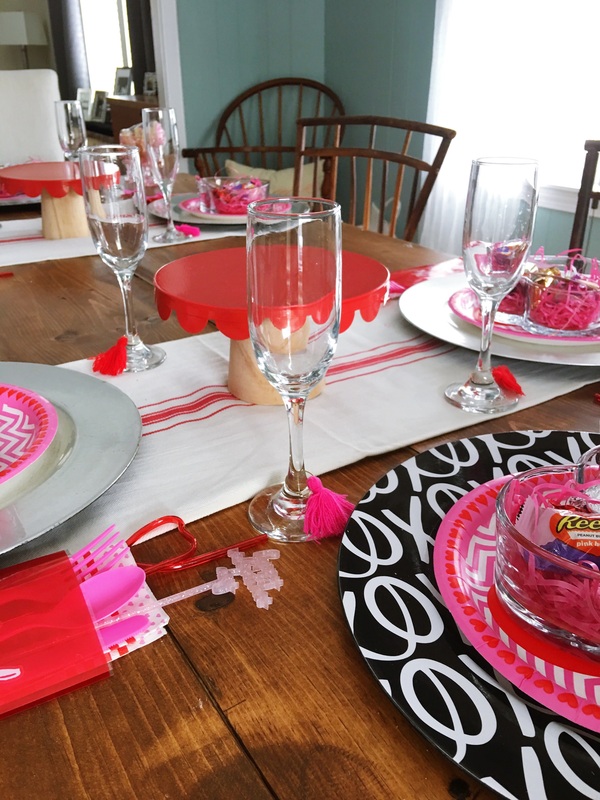 Previous Post Styling Harvard: Valentine’s Day Dining Room and Free Printable!